PAWTUCKET, RI, U.S.A., June 9, 2015: A new family of thermoplastic elastomers (TPEs) for consumer products provides vivid color, tactile appeal, and soft-grip ergonomics while spanning a broad range of physical properties and exhibiting excellent moldability, it was announced today by Teknor Apex Company, which will introduce the compounds at Fakuma 2015 (Stand B5-5315). With a light hue in natural form, Monprene CP Series compounds exhibit excellent colorability. All grades are suitable for skin contact and are resistant to cosmetics and household chemicals. When over-molded onto a rigid substrate, they provide a soft grip with ergonomic benefits. 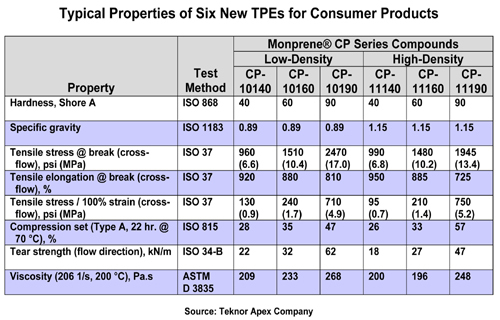 The high-flow properties of Monprene CP Series TPEs make them suitable for a wide range of part shapes and sizes in injection, insert, and two-component molding. They exhibit excellent adhesion to polyolefins. 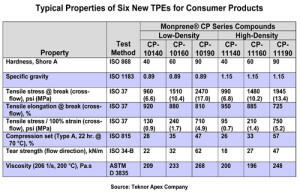 Teknor Apex recommends Monprene CP Series compounds for grip, handle, cushion, anti-skid, anti-vibration, knob, and button applications in such products as writing instruments, sporting goods, appliances, tools, personal care items such as toothbrushes and razors, and flexible or soft items like toys.